Candidate - new resume: Sent to the candidate when a new resume is saved. Candidate - new message: Sent to the candidate when he receives a new reply from a company. Company - new application: Sent to the company when a new application is made on its job offer. Application canceled: Sent when an application is canceled. Watchlist - job canceled: Sent to users when a watched job is canceled. Candidate - job canceled: Sent to candidates on a job that got canceled after. Watchlist - job closed: Sent to users when a watched job is closed. Candidate - job closed: Sent to candidates on a job that got closed after. Company - new admin message: Sent to companies when they receive a message from the administrator. Company - job about to expire: Sent to the company the day before the job will expire. Watchlist - job will expire: Sent to users when a watched job will expire in 24 hours. Watchlist - job added to watched category: Sent to users when a new job is added in a watched category. Watchlist - job added to watched company: Sent to users when a new job is added to watched company. Watchlist - job added to watched location: Sent to users when a new job is added to watched location. Watchlist - job added to watched city: Sent to users when a new job is added to watched city. Company - job created successfully: Sent to the company when the job is created. Company - closed by admin: Sent to the company when an admin closes his job offer. Admin - job pending approval: Sent to the admin when a new job is posted and awaiting approval. Admin - job approved: Set to the administrator when a job is approved. Admin - job unapproved: Set to the administrator when a job is unapproved. You can enable or disable just some of the messages by clicking on them from the drop-down menu and checking or unchecking the checkbox. If you want them all to be activated be sure to verify them one by one! On the left side of the editor, you will find a list of various shortcuts that you can use with the text editor. (!) The CRON script has to be configured and running regularly in order for all the notifications to be sent. Jobs Factory allows you to create or import backups for job offers and locations. 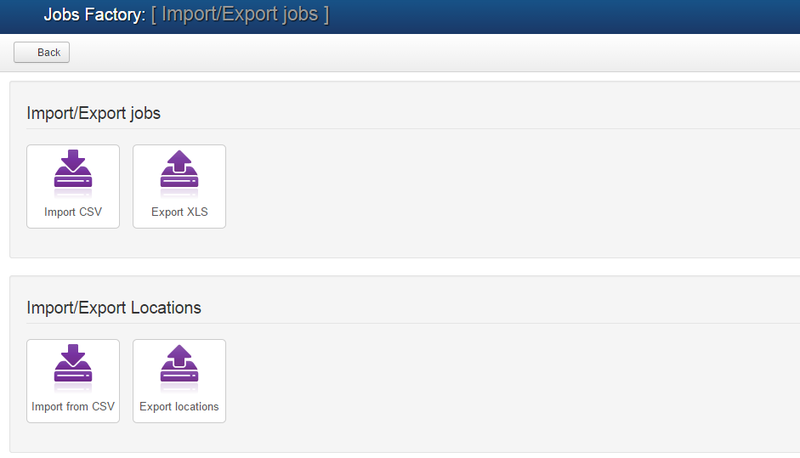 From the Import/Export section you can create ".xls" files by clicking on Export XLS, which will contain all the jobs that are available on your website or to import a ".csv" file adding additional jobs. Here you can also create backups the same way as for the custom locations you have created or to import already made ones. To import job offers or locations, click on Import CSV, Browse…" and select the ".csv" file from your local drive. These ".csv" files need to be written in a specific order and format to be eligible for upload since each value will be inserted in the database. For jobs CSV file you will need the header on the first row, containing all the names of the fields, and on the other rows, details about jobs that will be added in those respective fields. It is very important that the words must be written between quotation marks and all the information separated by tab spacing. In case of importing locations, you will need 2 ".csv" files, one containing the areas/regions and another one containing the cities. The same as before, order and format of the files is very important. The words must be written between quotation marks and all the information separated by tab spacing. To download sample data files similar to these please check this forum thread. (!) Take note that the Import CSV feature requires strict conventions in the files to work properly, each value is inserted in the database and order must be respected. Use the Exports as reference. Custom fields are not supported.